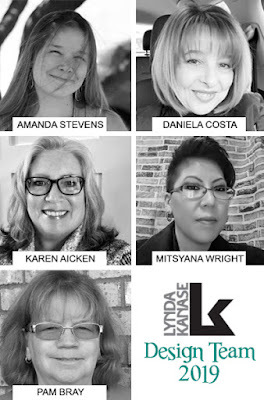 I am soooo excited to announce I am now on the Lynda Kanase Design Team! This is a fabulous group of women that I can't wait to share inspiration with. 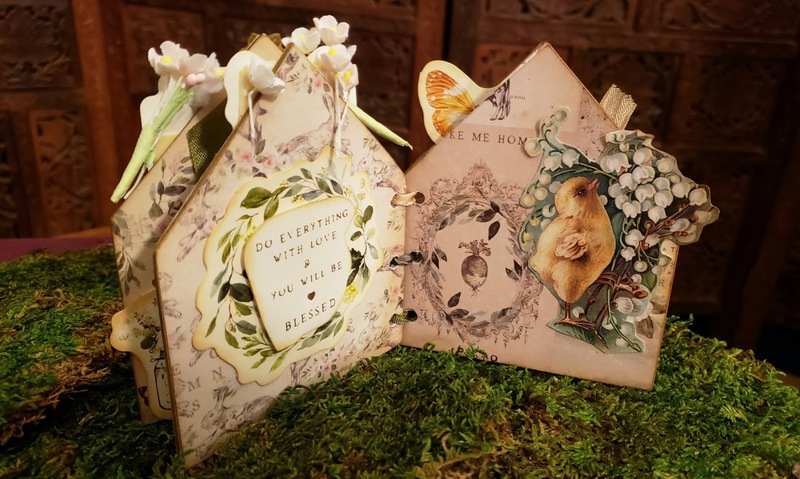 Please follow us along showing off our own unique take on Spring Things! 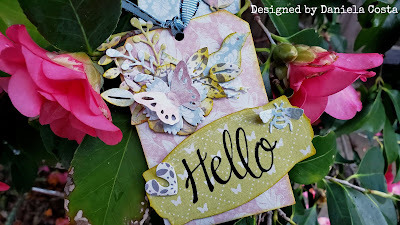 For these darling tags, I've used the Authentique Paper "Dreamy" It's so perfect for anything springy! 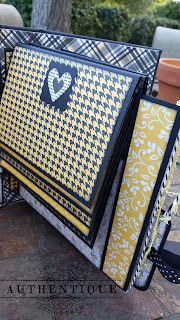 Using the Spring Things die I just cut out all the dies in about 4 different patterned paper. I then just started assembling little fun bundles of cute goodness. There are so many little elements and they layer all together just beautifully. 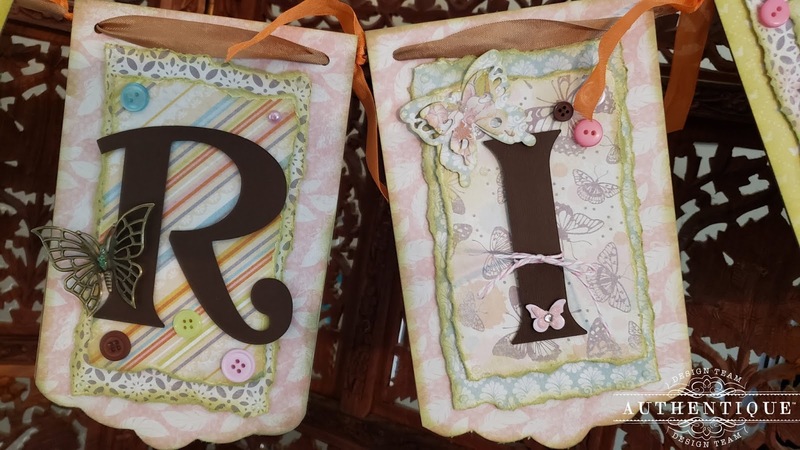 Lynda has a way of designing, thinking of multiple uses and themes. 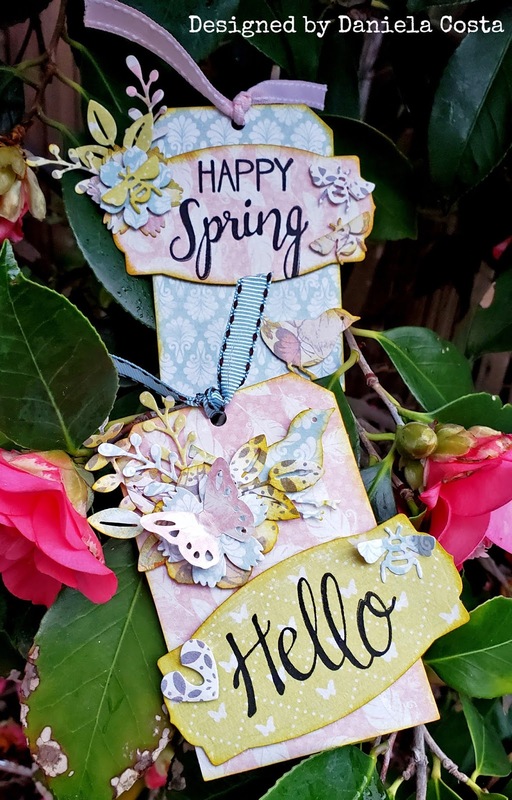 I've also chosen to use her Spring Phrases for each tag. I hope you've enjoyed my take on Spring Things! Follow along and see what my other teammates have in store for you! 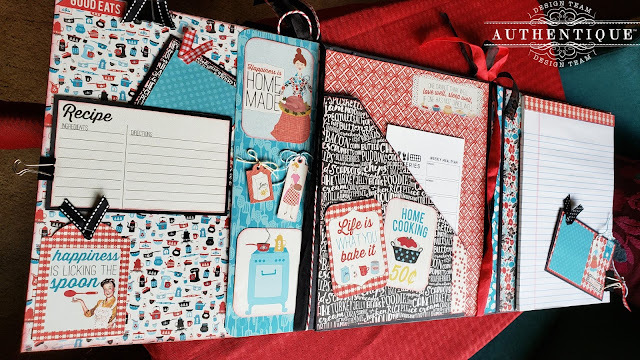 Hello Friends, Daniela here, sharing with you a Recipe Folio Notebook. I've used the adorable Ingredient line which is a little vintage, a little kitch, and oh so colorful and just makes me happy. I followed along a video by Country Craft Creations Tamra Kilgore -Merrill. I used her tutorial video to get the base down and then ran with my imagination on it. This was a ton of fun to put together. I can't wait to make more! With this folio, I really just ran with it and added a few things that I wanted. I added an envelope on the front that features a magnet closure to hold my business cards (or anything I need quickly). 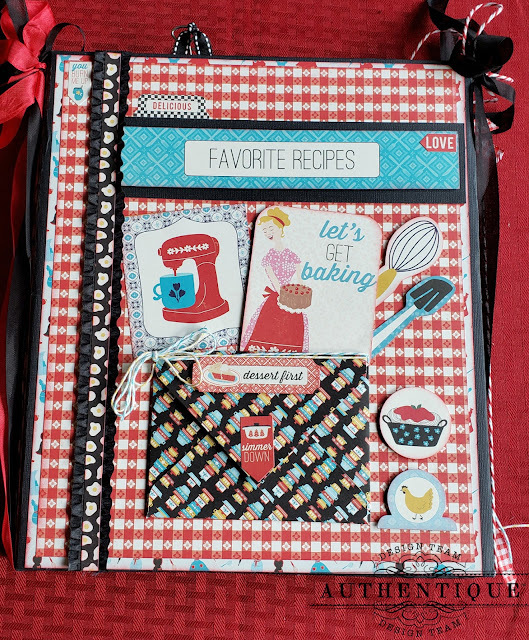 Using cutouts and stickers from the Ingredient collection, so stinkin' cute! Below is a close up of the post-it note holder I added to my notebook. 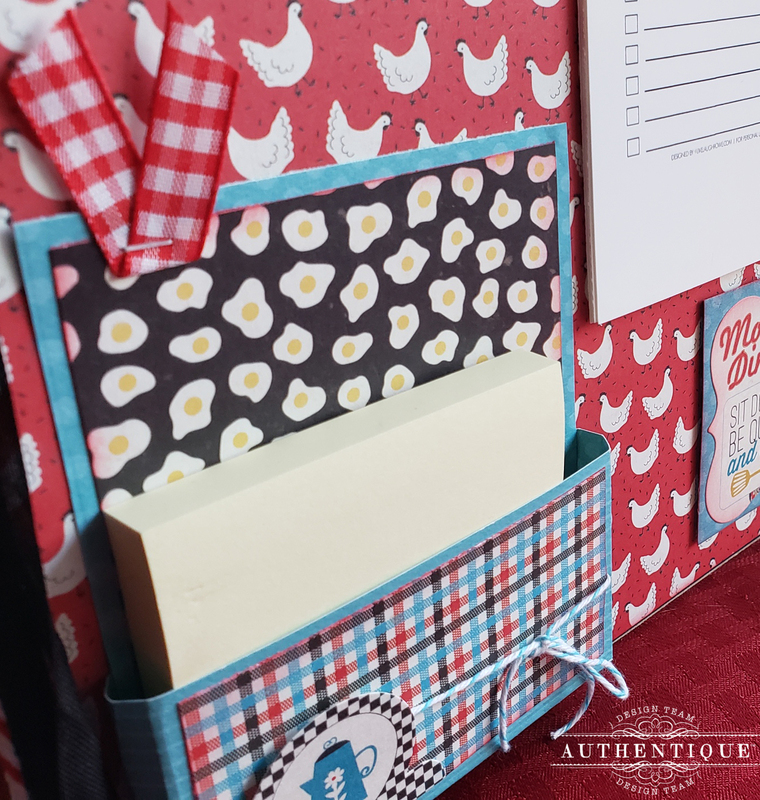 The little noteholders are super easy to make and there are a ton of free tutorials on Pinterest. Here is a full photo of the pages all the way opened up. On the far left I've added a little slide pocket on the edge. I've made little Recipe Cards that have the Recipe on one side and a place for a photo on the back. The middle of the Notebook is a large pocket. I've just tucked one of my menu planners in there for now, but recipes from magazines, etc. can be put here. 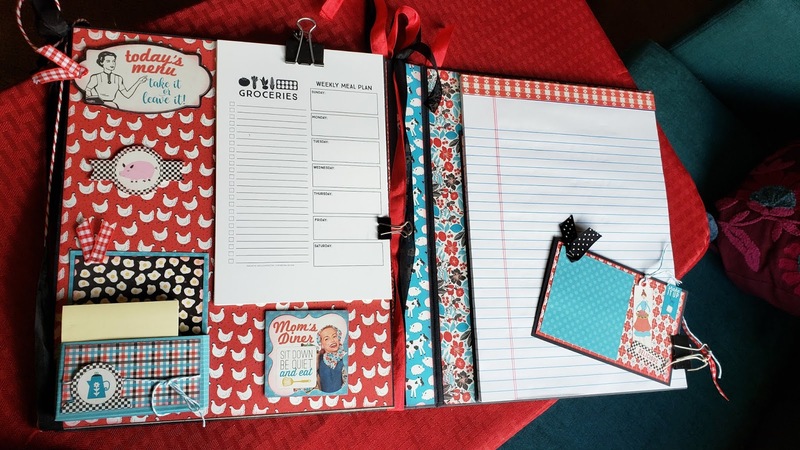 Lastly, the page that holds your standard notepad, with another Recipe Card attached. 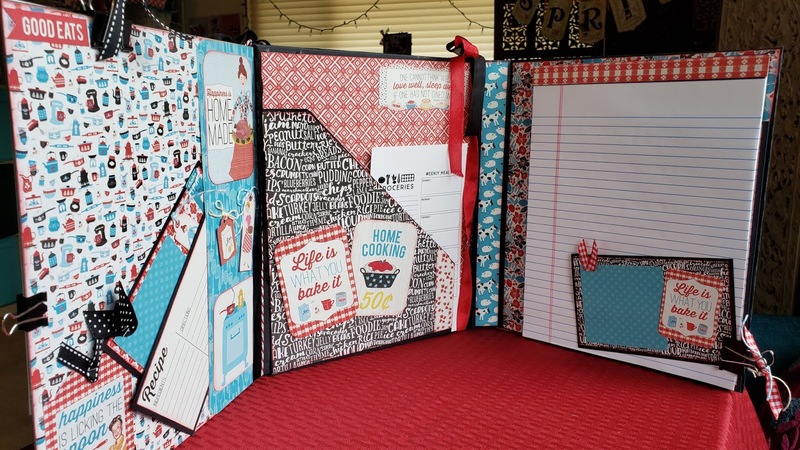 Another view of the entire Notebook Folio open. I had seen this video on Facebook and had it in the back of my mind that I really wanted to make one! I made sure I had all my supplies on hand to make just the base of the project. Decorating came later at my own pace, also adding additional elements I wanted for my notebook. Tamra's video's are fantastic, she does the weekly videos for Authentique every week, along with her own for her shop. Go give her a visit! Thanks so much for the inspiration Tamra, and I can't WAIT to make these in every theme out there. 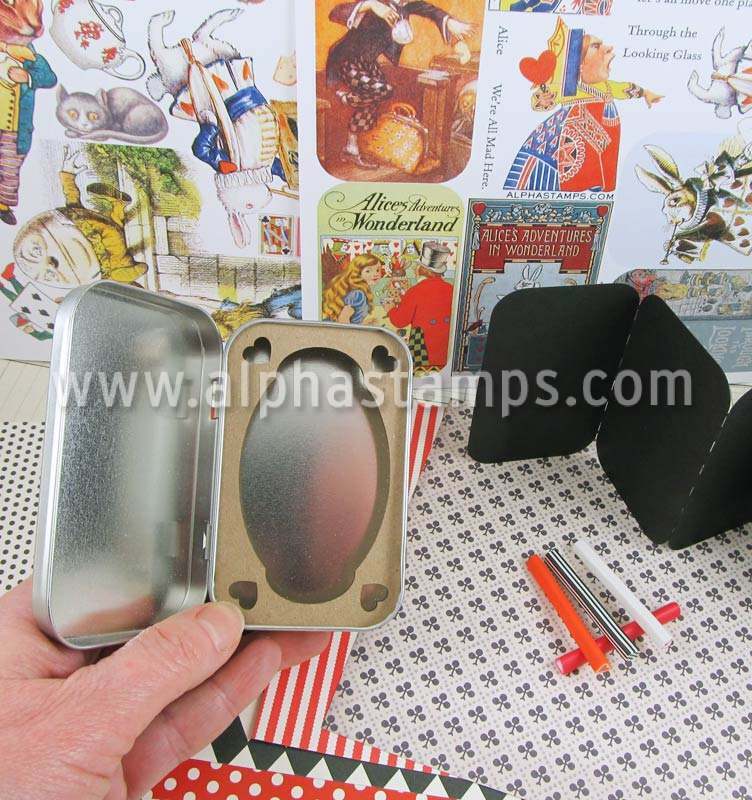 Alpha Stamps April Kit - Alice's Dream - OMG! 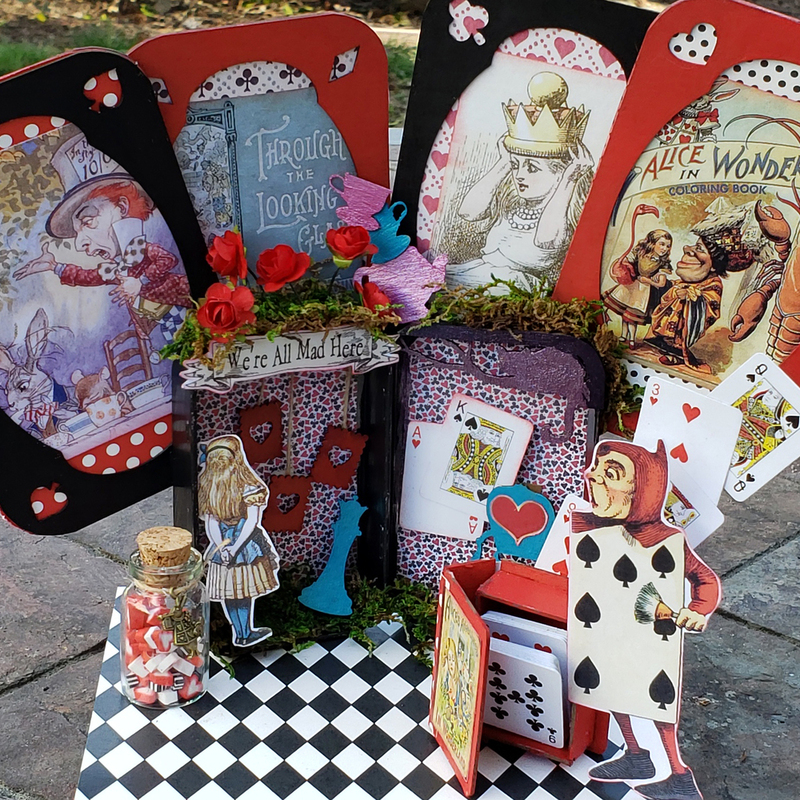 This was SO MUCH FUN to make! 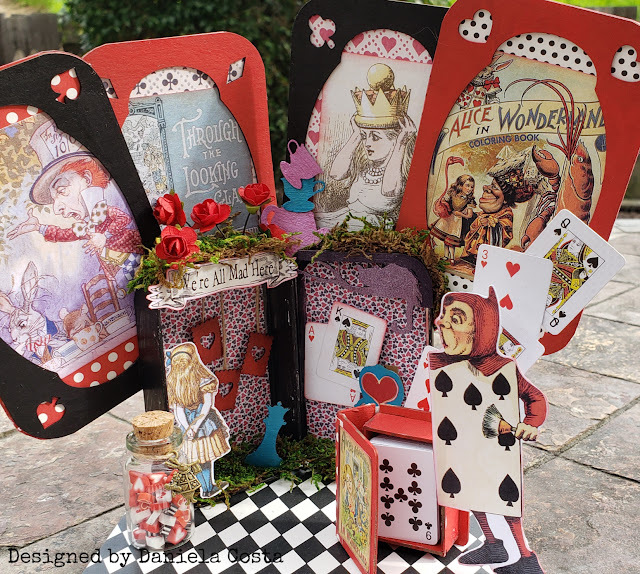 The Alice Kit this month is AMAZING! 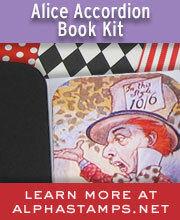 I've added all kinds of fun items from the shop to the April Kit. Let's start with these FANTASTIC large chipboard playing cards; These come in two pieces, your background, and the top. 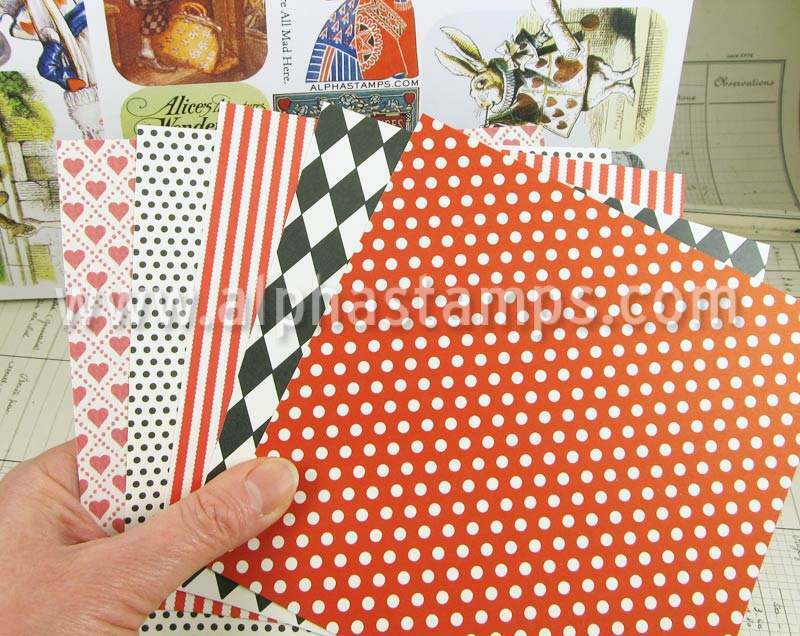 I've covered the backgrounds with the darling papers that come in your kit this month, then picked out different images from my Alice Collage sheets (You'll find my complete list of supplies at the end of my post). 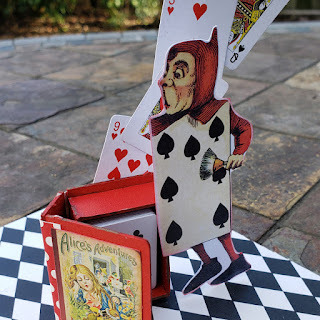 Before assembling my playing cards, I used red and black paint I had in my stash. There are so many little bits and pieces in here... 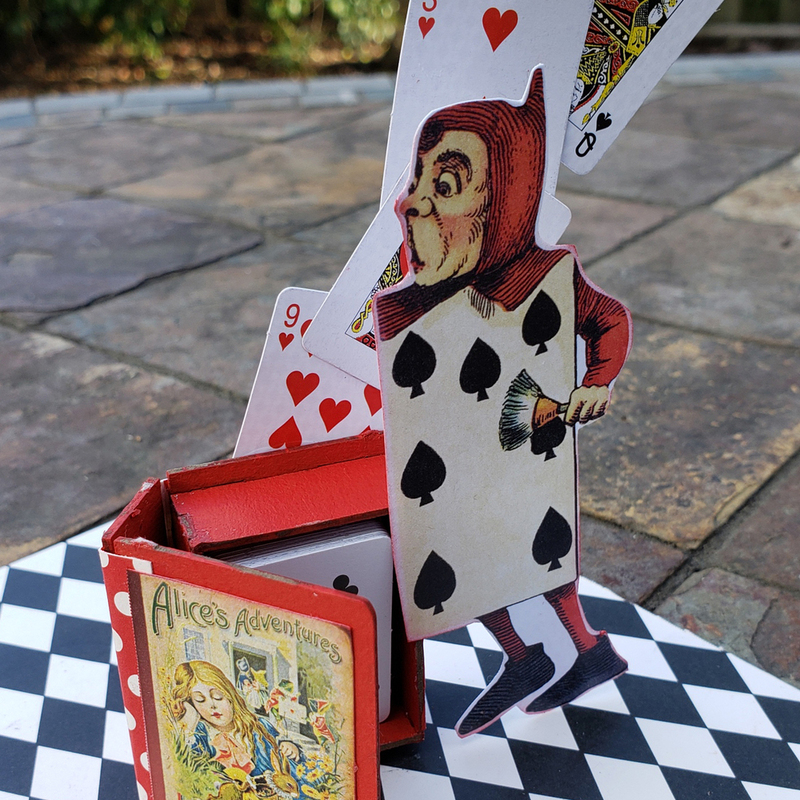 There are Tiny Alice Chipboard Props (find in the store! ), I've used many of them in my project. See if you can find them all, lol! 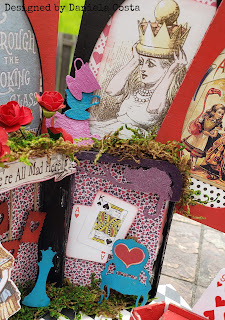 I spy a chair, a chess piece, hanging heart cards, teapot and teacups. 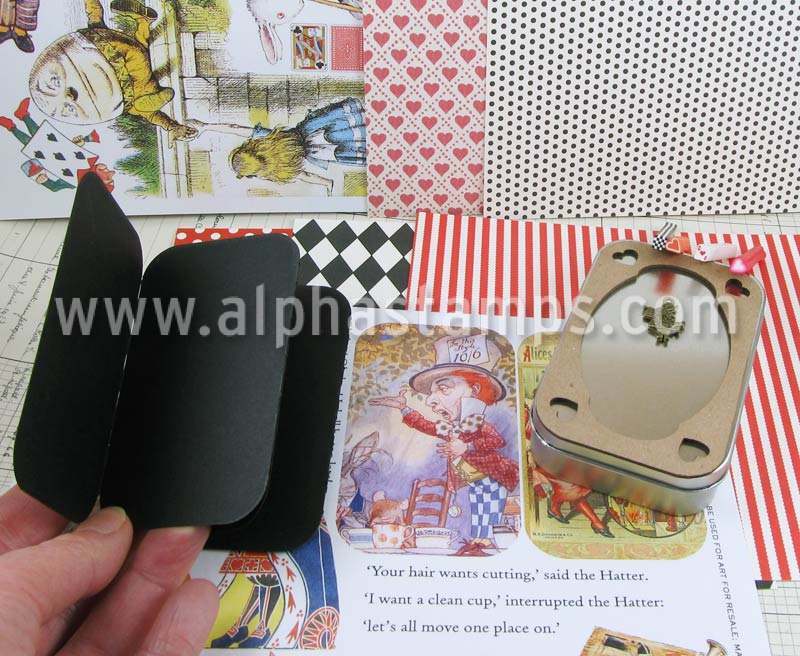 I've also used one of the Altoid Tin frames of Alice that has the Cheshire Cat on it. I didn't use it the correct orientation, so I just cut it out of the frame. I've just used some paints in my stash to color them. 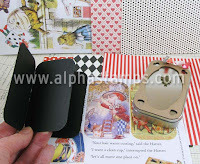 Another fun little side project, is the Faux Book Box Tiny Card Size, with the Mini Card deck. The Chipboard box needs to be assembled, and I added some paper for the binding, and cut out a mini book cover from one of the collage sheets and finished up the box. I made it look like the cards were coming from the back of the little box. I stashed the rest of the cards on the inside. I found one of the card footmen on a collage sheet and added him to the side. I really like this little element. 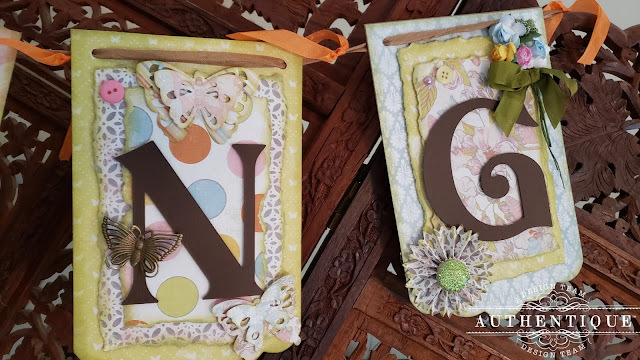 If you notice a little glass bottle on the bottom left of the project; The shop has these clay sticks of different shapes that you can customize for your project. I just used my xacto knife and made little slices... they are ADORABLE! I hadn't even seen this before, so it was so much fun and easy to add this darling element to my project. I cut up the clay pieces and added them to a 1 1/2' glass bottle. 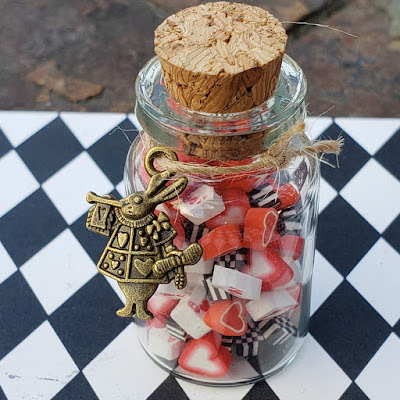 Then, I took the Medium Bronze White Rabbit Charm and tied it around the bottle with some twine. 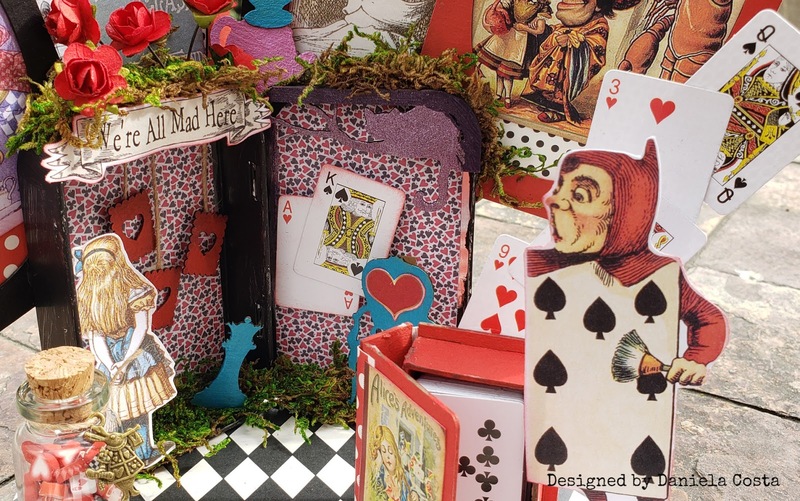 I think every Alice project needs to have moss somewhere on it. I've scattered some moss here and there to give it that forest look! 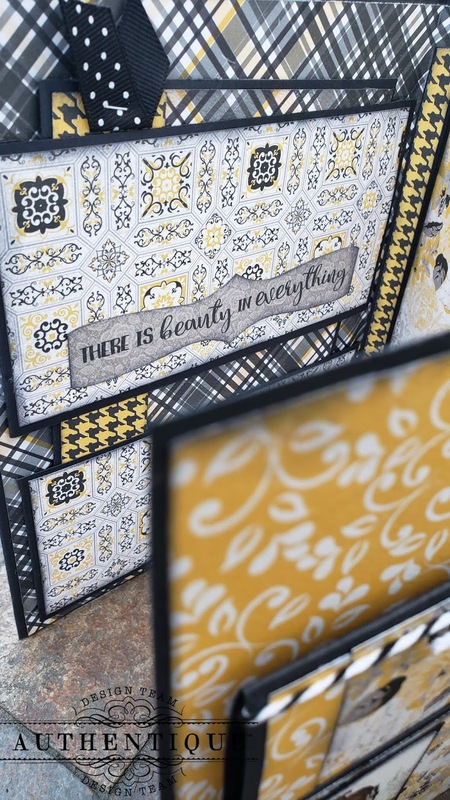 For the "floor" of the project, I took a 6x6 piece of chipboard I had in my stash and covered it with this fantastic paper that is in the April kit. I hope you've enjoyed following me along on "Alice's Dream". Please pick up this kit at Alpha Stamps and here is a link to my additional supply list from the website! THANK YOU! Have you jumped on the "folio" craze yet? I think I'm super late to the party, but I wanted to start on my own, play with them, then finally design my own. Here is my first public folio! 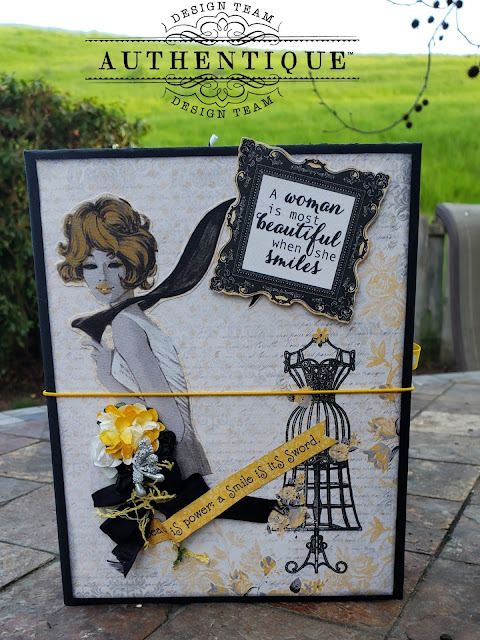 I've used bits and pieces of various videos I've been watching online, and used the gorgeous POISED collection! 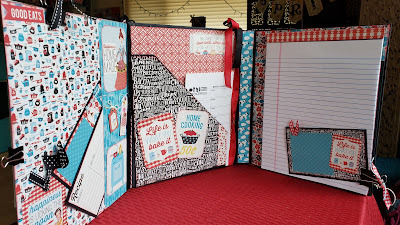 It's a huge folio with so many flips, flaps, pockets and photo mats... I just had to make a walkthrough video. I absolutely love this collection! It's uplifting, it's inspiring and its got the best images! The Folio album measures about 7x9. I've put a hole in the spine to add the elastic to keep it all closed. But wow, this puppy is large! These albums are a process and you need to be able to dedicate an entire day to making it, but they are really worth it when you're done. I really would love to add photos and journaling of my mother and grandmother in here. There are so many photo mats and little hidden pockets, so much fun to put together and decorate. The sayings in this collection are amazing "Beauty is power, a Smile is its Sword".. Just beautiful and perfect. Another great saying from this collection! "There is beauty in everything". I love this one! 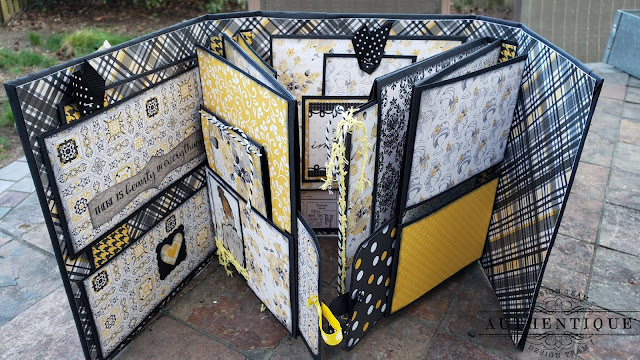 I had such a blast putting this huge Folio Album together using the Poised Collection. 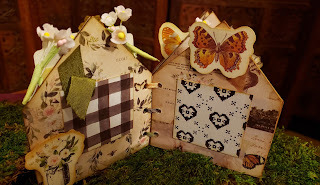 I hope you'll take a day, follow along a tutorial on how to make one and GO FOR IT! It takes patience and time, but you'll enjoy the process. 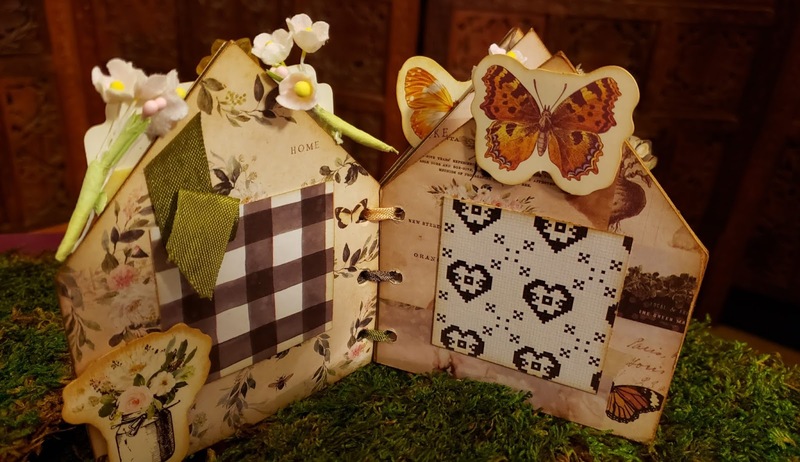 Alpha Stamps "The Bunny House" and "Farmhouse Mini".. My first official post... EEEEKKKKK! 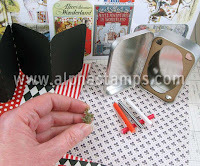 I am so excited to share with you my creations with the Alpha Stamps March Kit! This kit is incredible, the colors, the variety, it's just beautiful! 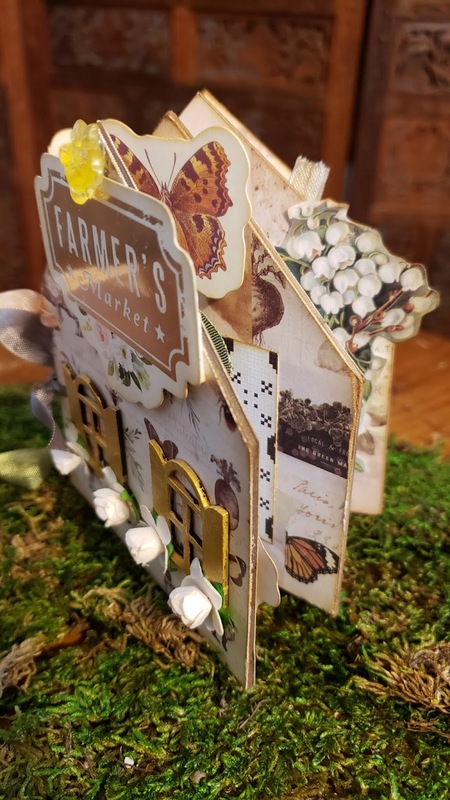 I've used elements from the Farmhouse collection, Chipboard House Box, and the most incredible Chipboard windows and doors. I've also added the darling mini flowers, and the acrylic flower on top of the house. **See full supply list link at the bottom of this post The box comes with two small holes on each side, so I weaved some wire, along with the seam binding and now I have the Bunny House! Let's take a look at some of these little elements a little closer! I covered the entire box with the fantastic whitewash wood paper from the Farmhouse Collection. 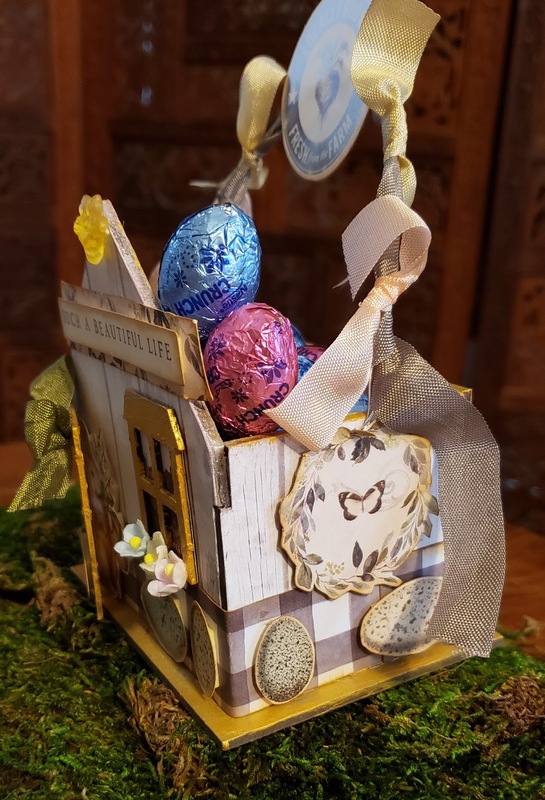 I then cut out vintage Easter Eggs from the Eggs and Easter Collage Sheet, along with my little bunny peeking out the door below. 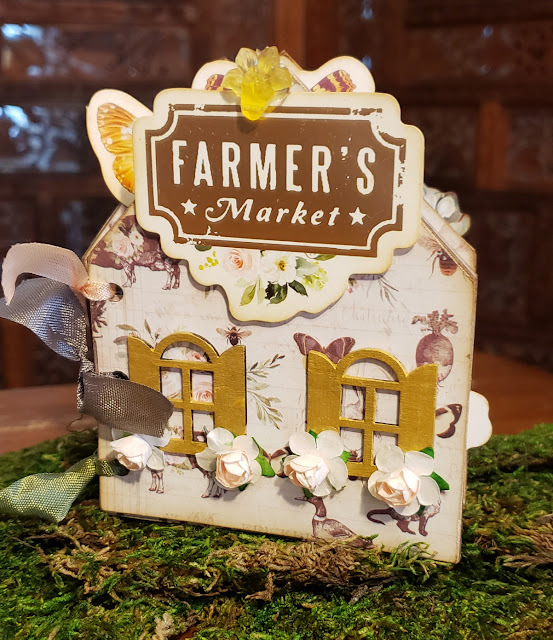 I used gold paint I had in my stash to paint the chipboard door and window. 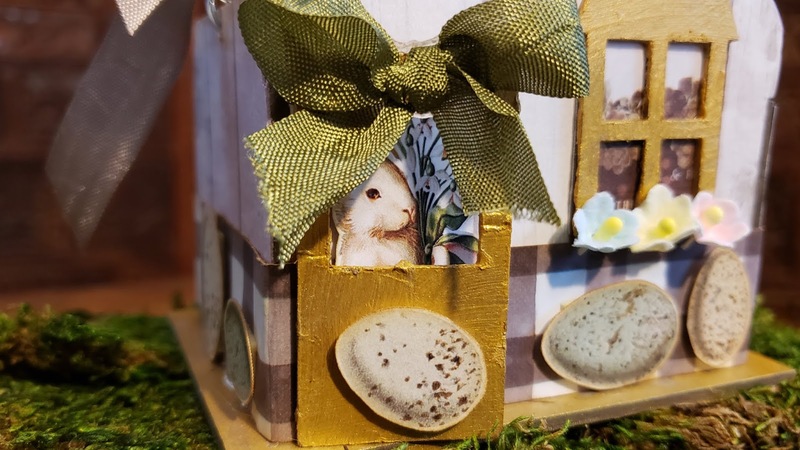 If you notice, I wanted my little bunny to show off a bit more cause he is soo cute, so I cut out the window portion of the door. I also added a mini paper hinge on the door and it does open and shut. My next little project is Farmhouse Mini. 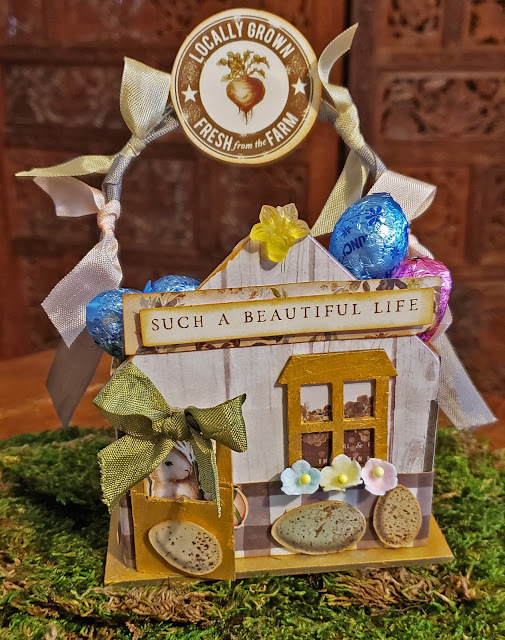 I used the Mini House Album with more of the Farmhouse Collection. I can't' tell you how excited I was to play with this. I love little things, and this just takes the cake! 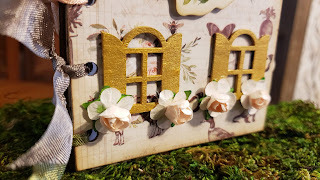 Using more of the chipboard windows which I painted gold, I added the mini roses on the bottom. 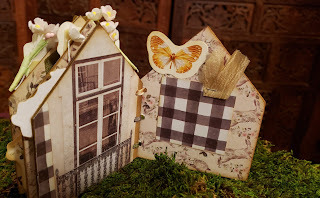 I punched holes on the sides of the House Album and tied a ribbon through them to complete the album. 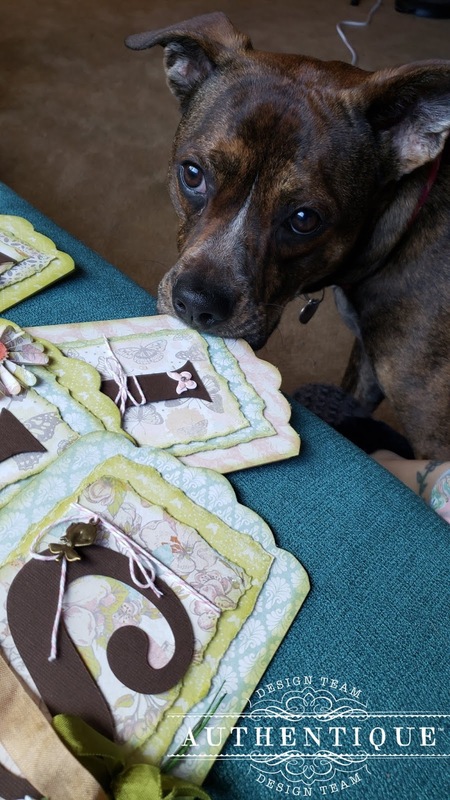 Throughout the little album, I've added photo mats, cutouts from collage sheets, and ephemera from the scrapbook paper. Here is a close up of the little windows with flowers and then a side view of the little mini. I absolutely LOVE making these types of miniature things. Below are a few photos of the inside of the little mini. It's amazing what you can fit inside one of these little House Mini Albums. 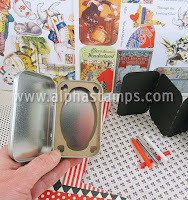 Thank you so much for looking at my take on the March Alpha Stamps Kit! I am so honored to be on their team, and am really excited for whats to come. Make sure to support small business and pick up a March Kit with all the extras! Hello Friends! Daniela here to share with you a really fun "Spring" Banner made with the "Dreamy" collection by Authentique Paper. This collection is just what we needed on these cold dreary days. I know we are all dreaming of Spring weather and sunshine. This collection definitely puts you there! 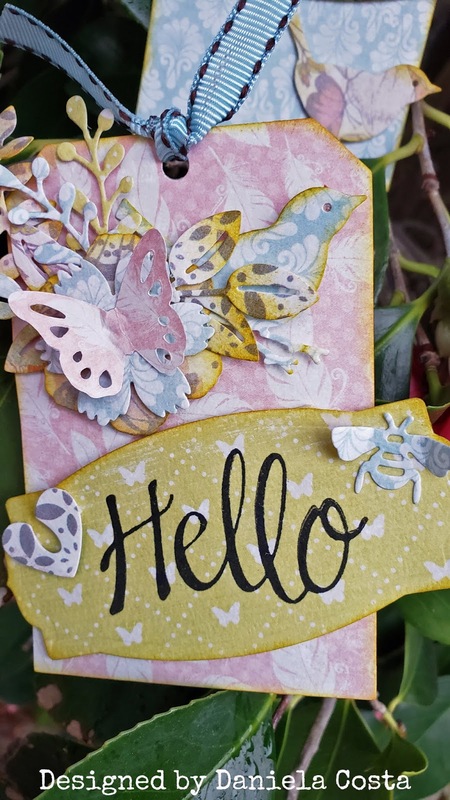 From beautiful florals and Butterflies to darling cutouts of sweet girls with wings, there are so many things you can do with it! 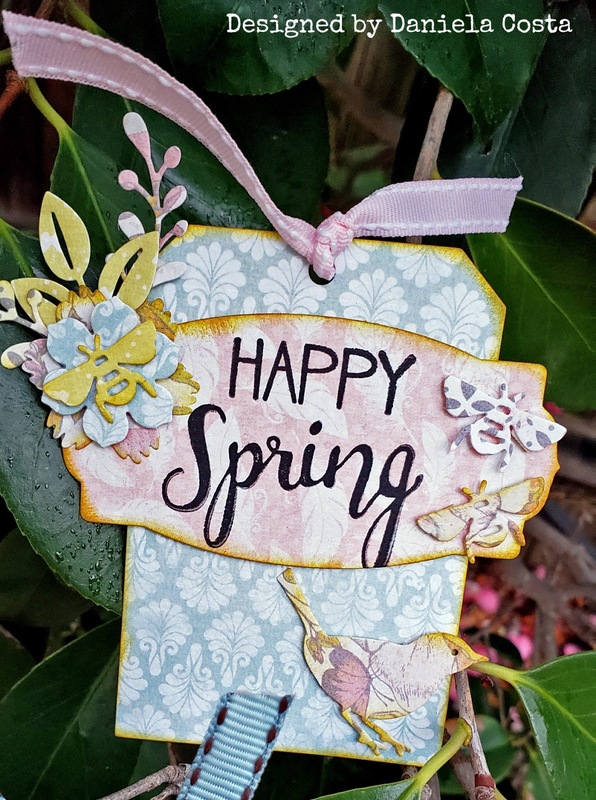 I had a Chipboard Banner just waiting to be made so I decided to use the Dreamy collection and make this Spring Banner. 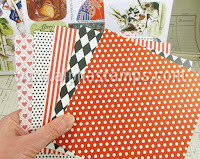 I love to layer the Authentique Papers as they all coordinate so beautifully together. 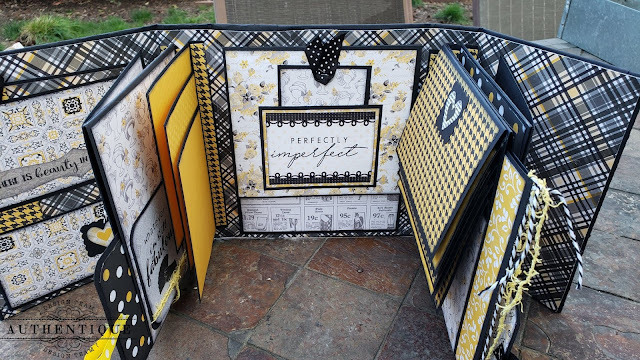 I've used tearing, inking and lots of pop foam on each panel to give it lots of depth and dimension. 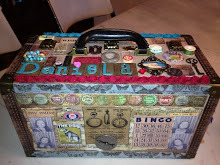 I also pulled out my flower stash, buttons, and some dies that would work well with my theme, rosettes and butterflies! As you can see on the first two letters, I've done a bit of layering of each of the pieces. Tearing and inking all the edges really makes each layer and paper stand out from each other. The top layer if the beautiful floral paper. I've tied twine and added a charm, plus a mini bouquet of flowers. For the P I've added a Rosette along with some butterflies dies to compliment the panel. Lots of inking and pop foam on all of these as well! For the R I've layered and inked all my edges. I've also found a great metal Butterfly in my stash of charms and it matches perfectly for the banner. On the I, I've added twine some die cut butterflies from the paper and some buttons. 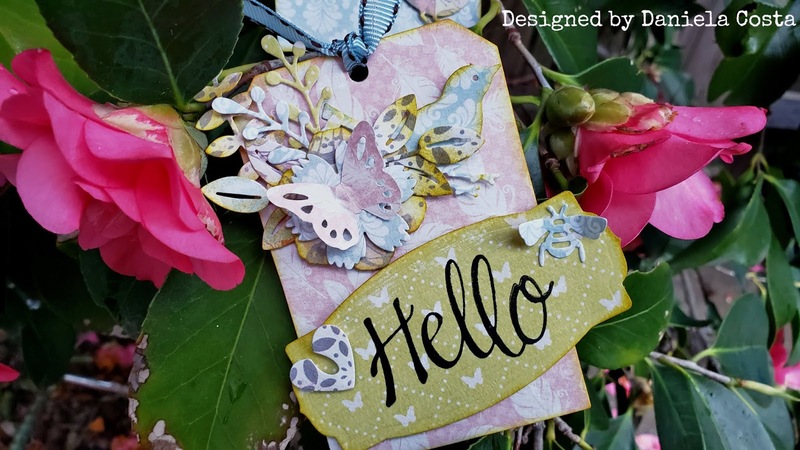 The last two panels follow the first, with more butterflies in the paper and a metal one, along with a beautiful Rosette made from the paper and another mini bouquet of flowers. 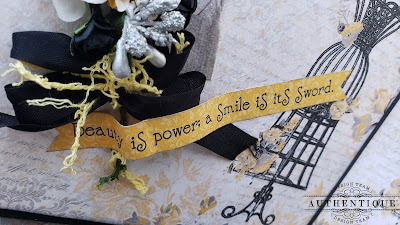 I had so much fun making this banner and it sure brought a little sunshine to our dreary rainy weather. 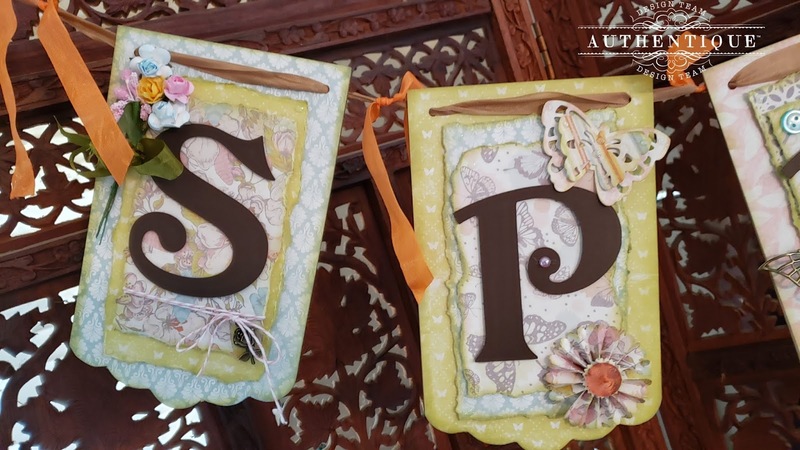 I hope you'll make yourself a beautiful Spring Banner with the Dreamy collection! I had to add this photo of my little Ginger. She is always being a cute little puppy and this morning was no different. As soon as I went to hang the Banner to photograph it, she was trying to grab it right off the couch! Silly Girl! 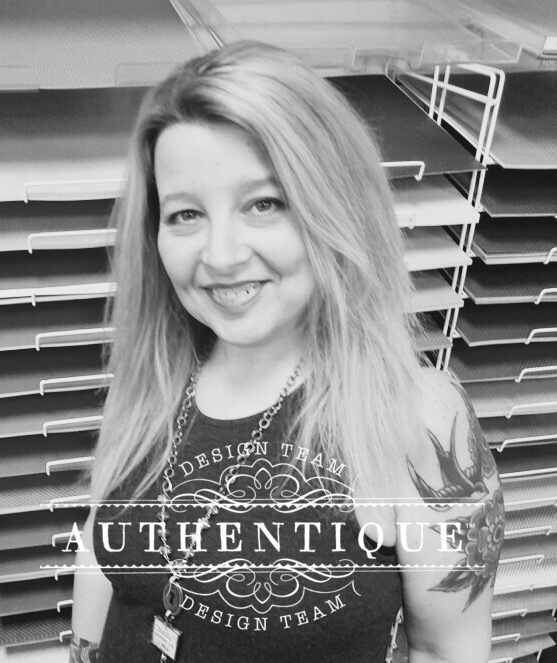 I'm a Alpha Stamps Design Team Member! So, if you have a cup of coffee and have some time, go through their blog, website, Instagram give them some love and be ready for really fun whimsical things! I'm over the moon excited, honored and you'll LOVE it too!